"Sampath Speaking" - the thoughts of an Insurer from Thiruvallikkeni: bails flying ~ batsmen not walking ... the glowing bails..
bails flying ~ batsmen not walking ... the glowing bails..
Heard of Golden Bail Award ? 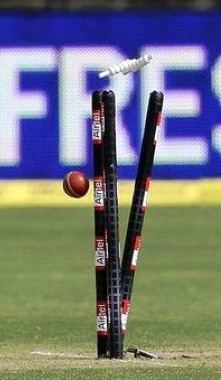 ~ in the game of Cricket, bail is one of the two smaller sticks placed atop the three stumps to form a wicket. The bails determine when the wicket is broken, which in turn is one of the critical factors in determining whether a batsman is out bowled, stumped, run out or hit wicket. Ricky Ponting and Adam Gilchrists were poles apart – Gilly walked upon edging Arvinda in a WC match…. Ponting would never go unless ordered by the Umpire…..the same Ponting wanted Indian batsman to go, when he claimed that he had taken a catch clean…… !! Now the first test in the present Ashes Series which England narrowly won has raised dust on umpiring the DRS – the decisions of Trott, Broad – Ashton Agar all under a cloud… Cricket is a gentleman’s game ~ they say. 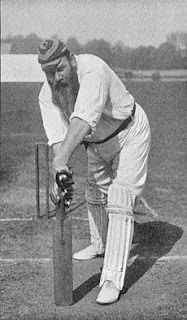 There was WG Grace… William Gilbert "W. G." Grace, MRCS, LRCP (1848 – 1915) who is associated with the development of the sport and is considered by many historians to have been the greatest cricketer of all time. Universally known as "W. G.", he played first-class cricket for a record-equalling 44 seasons, from 1865 to 1908, during which he captained England, Gloucestershire, the Gentlemen, Marylebone Cricket Club (MCC), the United South of England Eleven(USEE) and several other teams. He came from a cricketing family : the appearance in 1880 of W. G. with E. M. Grace, one of his elder brothers, and Fred Grace, his younger brother, was the first time three brothers played together in Test cricket. Right-handed as both batsman and bowler, Grace dominated the sport during his career. Grace qualified as a medical practitioner in 1879. Because of his medical profession, he was nominally an amateur cricketer but he is said to have made more money from his cricketing activities than any professional cricketer. He is credited with the now famous incident…. After being dismissed in a minor match, W G Grace simply replaced the bails, telling the umpire: "They've come to watch me bat, not you umpire." ~ a recent press newsitem recalling this wrote of England…. ‘they haven't been walking since WG first refused to go’…. Century later Robert Mugabe, president of Zimbabwe was quoted as saying 'Cricket civilises people and creates good gentlemen. I want everyone to play cricket in our country. I want ours to be a nation of gentlemen.' ~ now there are less of “walkers and more of stayers”… It is stated that way back in Dec 1962 at Melbourne, England wicketkeeper came up with an appeal showing the dislodged bail with Bill Lawry as striker; Lawry went on to amass 177. This is no post on Aussies or Britons not walking….but of the bails and an illuminating innovation. We have seen it all – colours everywhere – colour of ball changed from red cherry to white; players dresses changing from white to various colours with many logos; the changing colour of sight screen and more… recently, T20 heralded another illuminating innovation with the introduction of stumps and bails that light-up when dislodged during an Australian Big Bash League (BBL) match in Melbourne. 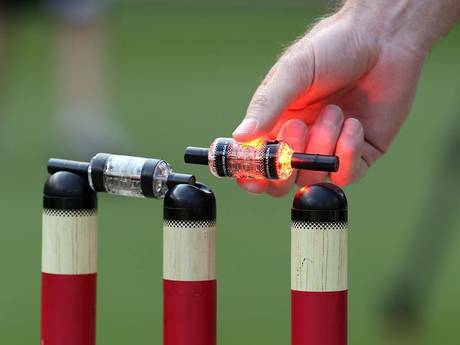 Powered by hidden low voltage batteries, once the wicket is broken, the bails instantaneously flash bright red thanks to LED lights and send a radio signal to the stumps which also light up. "These light up stumps are all about enhancing the spectator experience during BBL matches and ensuring that the BBL remains highly entertaining for the fans," BBL Senior Manager. "The stumps do not have any effect on the playing conditions nor will they be used in any part for umpire decisions," he added. The developers of Zing Wicket system are quoted as saying that the innovation would spice up the experience of a dismissal. A flying bail causes entertainment and an illuminated bail would add to that.